I don’t know about you, but I’m getting tired of my kids’ clothes wearing out. I mean I get it; they cannot keep their yogurt on a spoon to save their lives, so it’s no wonder I wash their clothes constantly. Is it so much to ask, though, that clothes not fade right away or get little holes in them? Much as it pains me, I finally came to the realization last year that I need to buy better clothes for my kids, not to impress anyone or to have them wear fancy things, but just so the clothes freaking last. I was in such a habit of getting cheap pajamas on sale for under $10 and grabbing little shirts here and there that shrunk right away. None of this really clicked until my mom sent my son a pair of nice Hanna Andersson pajamas. These pajamas usually run around $40 new (although I think she got them for less on eBay). 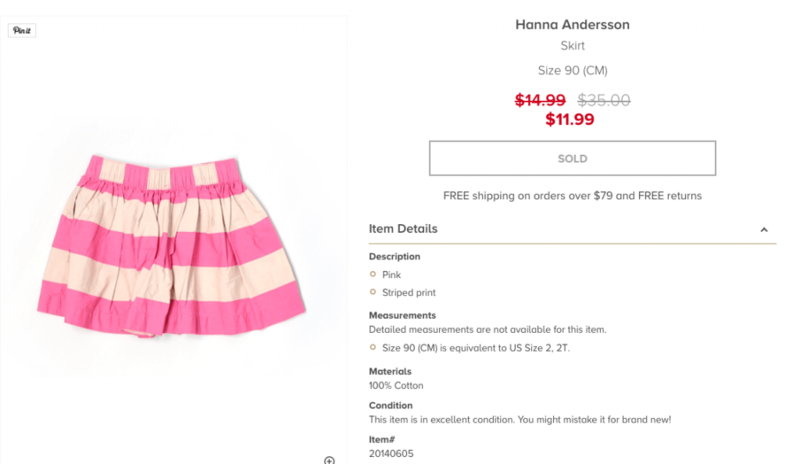 Anyway, I just happened to notice that while all our other pajamas were shrinking and fading, the Hanna Andersson pajamas did not. The red stripes on them are just as vibrant as they were the first day I got them. So, I started searching for this brand and other nice brands like Polo and Boden for my kids, but I quickly realized I’d go bankrupt if I bought them brand new. Even with the sales on those websites, I just couldn’t bring myself to buy them at those high prices. So, what’s a mom on a mission to do? Well, it’s not going to be much of a secret anymore because other moms are finding out about it, but I’ll tell you my secret place to buy long lasting, really nice clothes for a huge discount: ThredUp. Now that I’ve tried it, I plan to buy my kids’ clothes here from now on. I was pleasantly surprised that the box showed up looking all fancy-like. Everything was packaged really nicely and wrapped in pretty paper. It honestly looked nicer than brand new clothes I’ve purchased from Old Navy and Gap, etc. 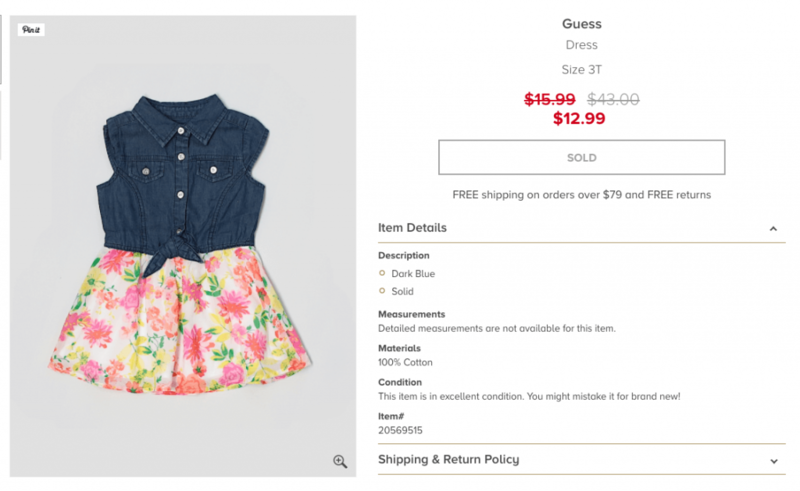 I thought it would be helpful to post actual screenshots of clothes I bought for my kids from ThredUp. That way you can see the prices I got. The clothes below are great brands like Polo, Crewcuts, Guess, and Hanna Andersson. 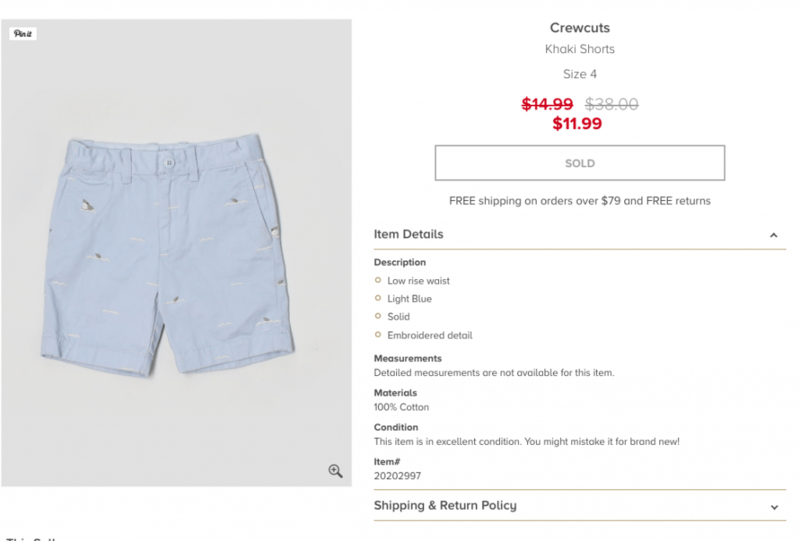 On the website, you can filter your searches to find clothes that are in excellent condition or if you are just looking for play clothes, you can get even better deals on clothes that are in good used condition. As you can see, I was definitely shopping clearance items and even one final sale item, but everything I bought was in excellent condition and for great prices. Some of the clothes I got are more for the summer and fall, when my kids start pre-school so they are just hanging in their closet waiting for the Detroit weather to warm up! 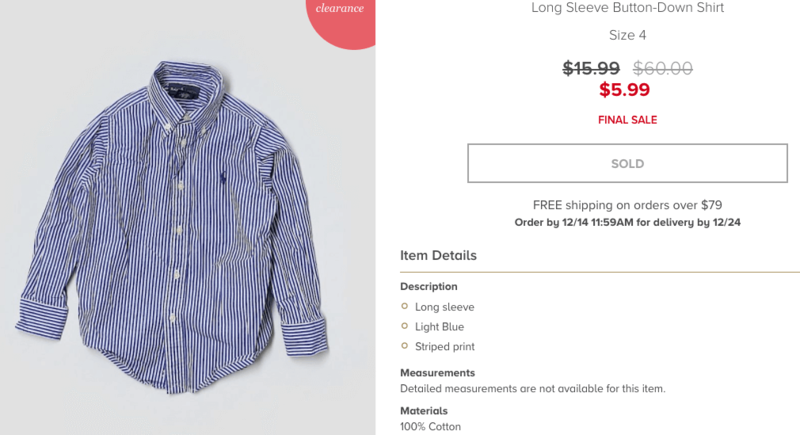 Of course, ThredUp isn’t the only place you can buy quality used clothes for your kids. I’ve had good luck at garage sales, in different mommy Facebook buy and sell groups, and at stores like Once Upon a Child. However, I’m leaning towards using ThredUp all the time because unlike the mommy Facebook sale groups, ThredUp let’s you return items as long as they are not final sale. 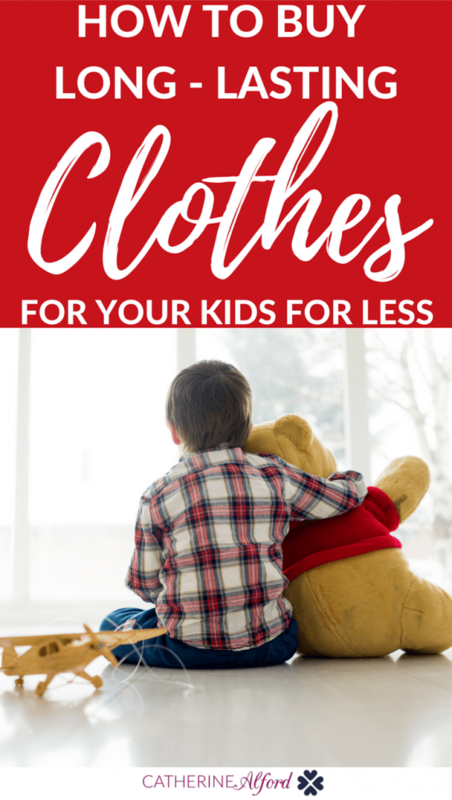 Also, unlike going to thrift stores, garage sales, and consignment stores, I don’t have to leave my house with two children when I shop at ThredUp! So now, I’d love to hear from you. Do you buy used clothes for your kids? What are some of your favorite brands? Where do you like to shop? We love ThredUp also! Swap.com and faceboook resale pages are our favs. Great article! My friend has an eBay store that specializes in stuff like this. They usually focus on adult clothes and shoes but do find really great deals on baby and kid stuff as well. They ultimately take the work out of you searching through consignment stuff. It still takes some patience and time, but I scored a brand new pair of uggs for myself for $70 through them (and not even because of the friend status). Ebay is great for that – to your point – of not having to leave the house! I don’t know all the particulars since my little guy is due next month and he is my first, but I see my other friends pay attention to the goodwill spots around the AZ valley and they will have super sales at least once a month from what I see. Also I have never heard of threadup so excited about that – thank you! I’m glad you shared another good website. Threadup seems a good source of high quality clothes in a very affordable price. I will try to buy some clothes from them. I will buy used clothes in a heartbeat! Most of the time my mom or someone else buys my kid’s clothes, so I don’t have to worry about buying as much. But if I need to fill any gaps, I love going to our kid’s consignment shop. I’ve used ThredUp before, but haven’t been as active with it lately. I will probably have to start checking it out again in the near future. You’re right, name brand clothes will have mama’s bankrupt if we’re not careful!